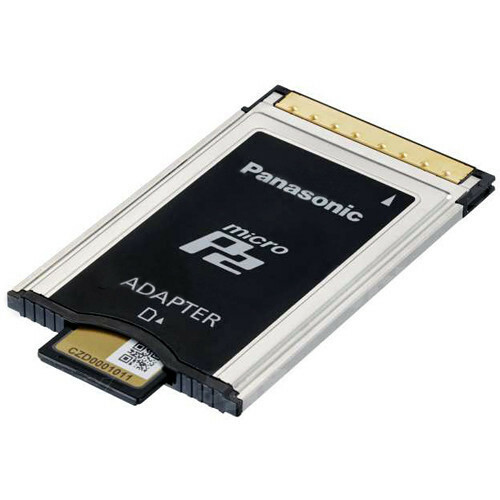 The AJ-P2AD1G microP2 Memory Card Adapter from Panasonic enables you to use microP2 cards in the full-size P2 card slots in camcorders. Since these are the same size as SD memory cards, you can also use many 4-128GB Class 10 SDHC/SDXC cards in this adapter, with interval rec, one-shot rec, loop rec, and one-clip rec disabled (some cards may not be usable). The AJ-P2AD1G features maximum read speeds of 1Gb/s and can write at up to 100Mb/s using the AVC-intra100 recording format (excluding 60p/50p), available when using microP2 cards only. When using SDHC/SDXC cards, you have access to DV, DVCPRO, DVCPRO50, and AVC-Intra50 formats, the last two of which allow for 50Mb/s maximum write speeds. Additionally, the adapter has CPS password protection. It requires a firmware upgrade of current P2 hardware.